Window Cleaning People offers a variety of power washing services. Whether you want your driveway, patio, deck, or vinyl siding to look like new again, Window Cleaning Peoples has an effective solution to remove dirt, grime, and debris for both residential and commercial property. Even if you protect your wood deck very well, over time it starts to look old and gray. It caused by nature, sun bleaches exposed wood fibers and it leads to splintering and discoloration. Our power washing services can bring back the natural beauty of the wood by removing loose debris and ground-in dirt. You don’t even need to be home for us to complete the power washing service. Window Cleaning People will make every effort to maximize convenience. Our professional technicians will carefully move any patio furniture or other belongings as needed to ensure thorough power washing. Why Choose Window Cleaning People? Power washing is one of the best ways to make outdoor surfaces like your driveway or walkways look clean and inviting. Power washing is also the best way to make your house look fantastic. And it will help protect the siding or the surface of the home by removing mold causing bacteria and other contaminants. Over time dust, pollen, dirt and other substances that get blown about in rough weather can cake onto the outside of the your home and areas like your deck or patio. Power washing is a safe and easy way to remove all that built up crud. But you should always hire a professional to power wash your home and outdoor surfaces. A pressure washer and someone who doesn’t know how to use it is a recipe for disaster. Professional power washing technicians know how to safely use high tech pressure washers. They can clean your home and other surfaces without damaging your home, deck or driveway. Professionals also have the best quality tools on the market so that the job will get done quickly and efficiently. There are some home projects that you can DIY and save some money. But pressure washing is a task that is worth paying professionals to do. We really only have one mission – to make our customers happy. We make sure that our technicians are well trained and have the best professional grade equipment so that you will be happy with the results of having your home, deck, driveway, garage, walkways and other surfaces cleaned. We always strive for excellence and want our customers to feel that the job was done right every time. From day one, Window Cleaning People has focused on doing one thing and becoming the best at it. Our expert technicians have more than 7 years of experience power washing. And they regularly receive updated training to make sure that their skills are sharp and they know how to use the most cutting edge technology. We’re the best at power washing and window cleaning because it’s all we do. We’re Window Cleaning People. Pressure washing is the most often recommended way to restore the beauty of your home and protect it from damage and debris. After winter storms and hot summer weather pollen, dust, debris, dirt and other things build up on the exterior of your home. And if you use a particular kind of mulch you may even end up with fungus or mold taking root on the outside surface of your home. Power washing removes all of that buildup. Your home will look fresh and clean and the outside of your home, whether it’s wood, siding or brick will be protected from damage. Power washing can make your home look as good as it did when you moved in. If you’re selling your home or if you have any family gatherings or parties planned getting your home pressure washed will dramatically improve the curb appeal of your home. Pressure washing can be dangerous for homeowners who don’t have experience using a high powered pressure washer. Most homeowners think that they can just rent a power washer for a weekend and clean the home, garage, and other surfaces on their own. But doing that is taking a pretty big risk. Not only are you risking your own safety you are also risking your home. 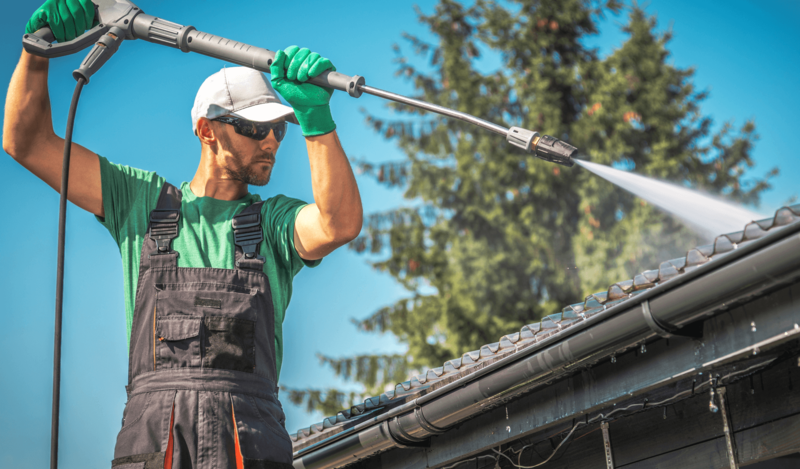 Inexperienced homeowners who try to powerwash on their own can damage the outside of their homes and even knock siding off completely by using a power washer incorrectly. More than 6,000 people go to the emergency room every year as the result of power washing accidents and injuries that occur from not knowing how to use a pressure washer properly. That’s why smart homeowners hire professionals like us to power wash their homes. We know how to get the job done quickly, efficiently, and most of all safely. Pressure washers need to be handled by well trained and experienced technicians. When power washers are used incorrectly they can cause major damage to homes, garages, and decks. It takes training and experience to be able to gauge the correct pressure needed to do the job. Power washing is a fantastic way to make your home look great without the cost of repainting but you should always trust a professional that knows how to handle the power washer to do the job. Hiring a pro will save you money, make sure that you don’t get hurt, and it will save you time as well. When you hire a professional cleaner you can be sure that your home will get washed correctly and you can use your free time for the things that matter to you, like spending time with your family. Another reason why you should hire a professional Toronto power washing company for your home is to lower the environmental impact of the job. Inexperienced homeowners can end up wasting a lot of water and may even end up putting pollutants in place where they shouldn’t be, like in the local water supply. If you want the job done quickly and efficiently, hire an expert! "Alex was at my townhouse today to clean all the exterior windows. He did an excellent job. Would definitely recommend this company. Will be using them again in the spring!" "Eugene was able to attend on short notice and did an outstanding job. Both he and his staff were professional, polite, efficient, and attentive to ensure my windows sparkled. I would highly recommend Eugene and his team. Thank you Eugene for your excellent service." "They did a fantastic job cleaning my siding, windows and gutters and the railing on my deck. We would not hesitate to recommend Window Cleaning People to my neighbours and family. I was impressed with the great effort of their hard-working crew."